Dozens of students and adults, a Maine firefighter who ran to help, Governor Janet Mills' niece -- these Mainers were all in Paris on Monday, April 15 to witness the devastating fire at the Notre Dame Cathedral. PARIS, France — It's a destination filled with history that people travel from around the world to see — and on Monday, another moment was documented forever, as the intricate arches of the Notre Dame Cathedral went up in flames. Tourists and Parisians alike watched in shock as the wooden frame of the building burned, sending billows of smoke over the streets of Paris and destroying a facade that is more than 850 years old. Dozens of Maine students, along with parents and teachers, were visiting the city when the fire broke out. Jan Vose was with a group of about 30 people total, from RSU 50 and Monmouth Academy, when they saw smoke filling the sky from the window of their cafe. The group had arrived in Paris on Sunday and hit the major iconic landmarks -- the Louvre to see the Mona Lisa, the Eiffel Tower, the Notre Dame Cathedral. They had stopped to get dinner at a cafe three blocks away when Vose says some family members in the United States began to text the group, notifying them of the disaster. The unknowns of the situation were scary at first. 'We didn't know what had happened," Vose recalled. "It could have been a terrorist attack." The students and adults made their way outside to get closer to the cathedral. Vose remembers the streets were blocked off, as people came out in droves, anxious to see what was happening. As Vose's group approached, she realized how intense the fire was, devouring the building's famous facade. "To see it go up in flames made our hearts drop," Vose said. "Some of the students started crying right away, and then it was the thought of being some of the last people to see the cathedral in all its glory that started to weigh heavily on others." A Maine firefighter from the Monmouth Academy area, Dan Roy, was on the trip with Vose. He left their group to approach the scene and try to help the local French firefighting units, feeling he had a duty to do so as a first responder. "The group was nervous for Dan of course, but he returned shortly, since he was unable to be of help," Vose noted. "It was noble of him to instantly offer his services to such a cause." Julia Mills Fiori, niece of Gov. Janet Mills, attends Waynflete in Portland. She was also on a tour in France on Monday and had visited Notre Dame just before the fire started. Fiori told NEWS CENTER Maine about the eerie coincidence and said the group she is traveling with decided not to go inside the cathedral. Instead, they headed back to their hotel, where they saw notices about the fire in their online feeds moments later. "Everyone seems to be in shock. No one knows what to do. I mean, when has this happened before?" Fiori said. "It's a huge fire from what we've seen. There was smoke earlier this afternoon, evening -- that we could see, even though we're a couple of miles away. And it was just way up in the air." An official from the French Interior Ministry says about 400 firefighters responded to the scene to combat the fire. Hundreds of these responders helped stop the flames from spreading to the north tower belfry, according to Paris fire commander Jean-Claude Gallet. As of late Monday night in Paris, a French official and the Paris fire chief reportedly told the Associated Press they think the cathedral's landmark rectangular towers have been saved from the blaze. The cause of the fire is not yet known, but French media quoted the Paris fire brigade, saying it could be "potentially linked" to a 6 million-euro renovation project on the church's spire and its 250 tons of lead. For now, the Associated Press reports that the Paris prosecutors' office is having investigators treat the fire as an accident. Vose noted how strange it is to her that she and her American students and fellow tour mates took some of the last pictures of this revered structure before the devastation. "We were all very thankful and emotional that we were blessed with the gift of experiencing (the cathedral) before the fire," Vose said. "One student even said she almost didn’t go in yesterday because she thought it wasn't that big of a deal, but she was so glad she did. Tonight made her realize even more what kind of a treasure the world has lost." Vose's groups continue on their trip to Venice tomorrow. But she says they're all having a hard time getting to sleep tonight, overcome with emotion after a day that will go down in history. "It was really a moment in time that no one will ever forget." 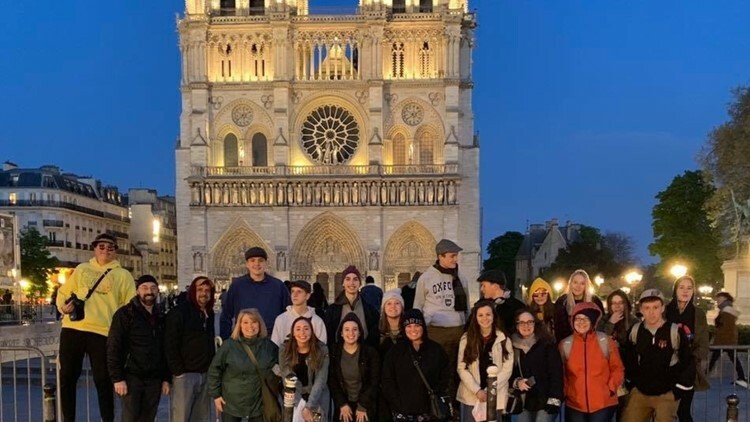 Maine students from Gardiner area High School visited Notre Dame on Sunday, April 14, just hours before a fire that destroyed the spire and roof, changing the skyline of Paris.